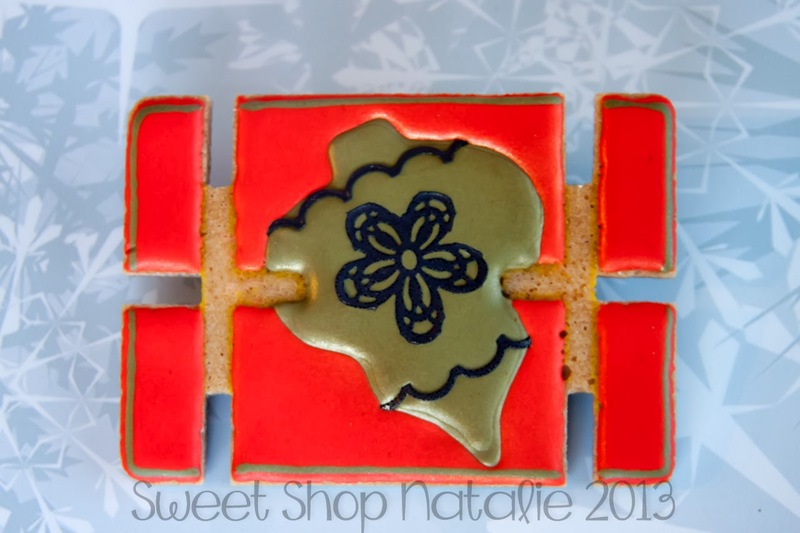 Sweet Shop Natalie: Gingerbread House of Cards! A few months ago I got a email from Rebecca, The Cookie Architect, asking me if I would like to participate in a cookie online collection project. I with out thinking said yes!! First of all I could not believe I was being asked to be a part of one of these online cookie collaborations that I have seen many times before and thought oh that would be cool to be in one of those. I of course kept putting off the project even after Rebecca had sent me my cookie to decorate. She baked and cut out the notches of all the gingerbread cookies and mailed them to all the cookiers participating in the project at the end of October. They were due back by the end of November. The inspiration for the project was to construct a house of Cards out of gingerbread cookies. The card deck was inspired by one designed by modernist architects Charles and Ray Eames. 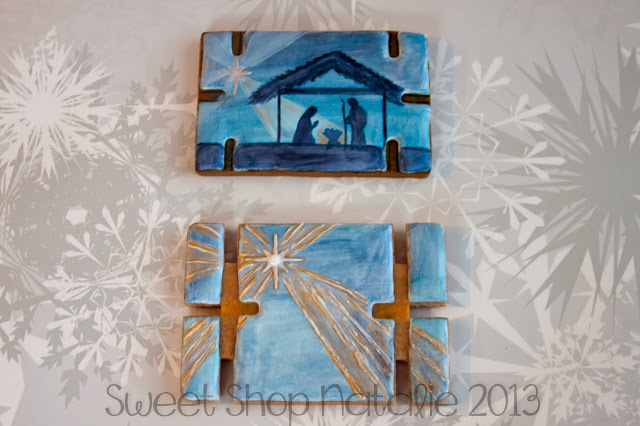 Here are a couple of the pictures from The Cookie Architects album of the finished project. Here is a pic with my cookie in it. Amazing to me that my cookie is so close to LilaLoa, Arty McGoo and Memories of Home! 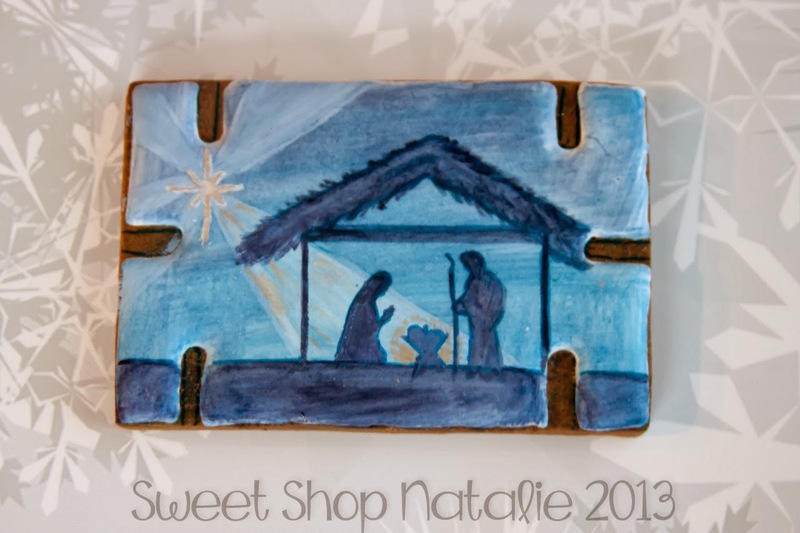 To see all of the picture and all of the other 27 talented cookiers click this link HERE to see them. I originally wanted to paint a picture of the nativity on my cookie. But I was so nervous to not practice so I made me a couple of practice cookies first. Well I thought I had made the right dimensions to copy the original cookie and I practiced on my version of the card. Well when I went to go do it on the "real" thing I did not like how it would fit on it and did not want to loose part of the scene in the cut outs so I just opted to do the new star. So below you see what I did on my practice cookie but it did not fit like I wanted on the real card so I did just the star. Here is a close up of my practice card. I really ended up liking it and so now it is sitting on my shelf in my kitchen and I hope to frame it and keep it for a new Christmas decoration. We were told to decorate with a Christmas or Winter theme and I wanted to depict what the true meaning of Christmas is, the birth of our Lord and Savior, Jesus Christ. 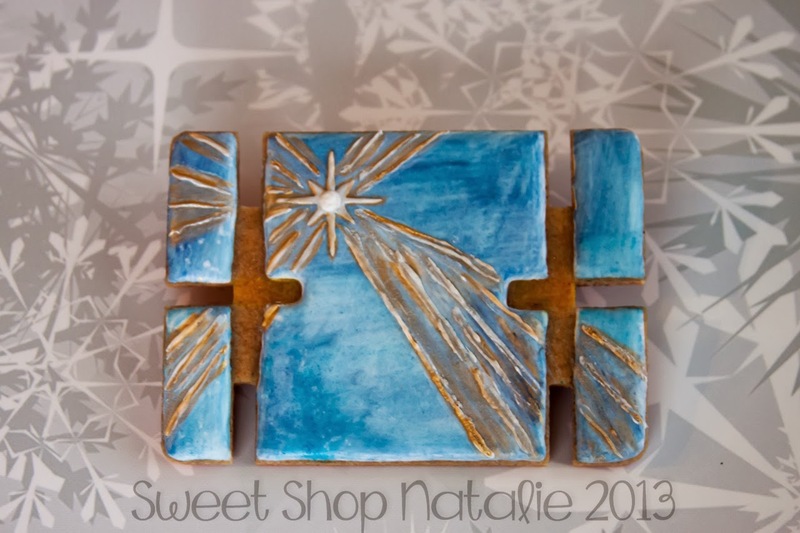 And her is the actual card depicting the new star, the sign our the birth of Jesus Christ. Then when I thought I had it all figured out and picked what I wanted to do on the cookie I was rereading a email from Rebecca I realized, "oh man we have to decorate both sides of the cookies!" I would think of different things to do but never could decided. So then I had some SugarDress left over from some cookies I had done and I figured I would use a piece to go on an Christmas Ornament and this is what I came up with. SugarDress is like Sugar Veil but easier and I have a post coming soon on it. Thanks for taking a look and please check out The Cookie Architects album to see all the amazing cookies in this project you will be amazed if you are not already by the 27 cookie decorators I was so lucky enough to join in on this fun project. Thank you so much Rebecca for inviting me in on this project and thank you for all your many many hours you put into this you are so so so wonderful!! What a great post! Thank you so much for participating! I loved all of your designs, and had fun fitting you in to the overall scheme!